Premium Truck Parts lives and breathes customer satisfaction. Within 30 days of your purchase, items can be returned to Premium Truck Parts via UPS. It's necessary to obtain a (RGA) number from Premium Truck Parts. Obtaining an RGA number ensures that the return process is handled effectively and that credits are issued in a timely manner. Premium Truck Parts offers a 30 Day Return Policy for products purchased directly from us on an approved case by case basis provided that the product is returned in the Original Sealed/Unopened Box. Premium Truck Parts reserves the right to charge a 15% restocking fee on any merchandise returned. Premium Truck Parts will refuse any returned merchandise if items are not returned in the original Sealed/Unopened Box. The customer is responsible for insuring each return and all carrier shipping charges on the return. 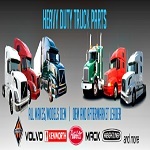 Premium Truck Parts will not accept returns via any other carrier other than UPS or Fed Ex. Customer will e-mail the tracking number to sales@premiumtruckpartsusa.com within 24 hours of return pickup. There are no returns on electrical parts unless it has a manufacturers defect. If the shipment is returned to shipper, Premium Truck Parts will then credit the customer in less the 15% restocking fee and shipping and handling charges, including all items paid for that returns with those refused boxes. If not all items are refused then only the items received back will be refunded. All truck orders that are refused are subject a restocking fee plus return shipping fees.